It has been another water-focused year, but less time on Kalessin in 2009 and more on other people's boats. 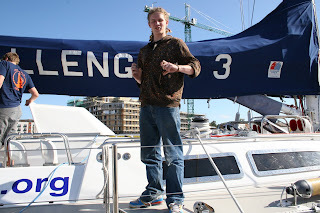 Sam (pictured mid-Atlantic with flying fish) has just completed his first-ever Atlantic crossing aboard Moonstruck, a Hylas 49 sailed by Alan Teed, his wife Joan and daughter Lauren. Alan and Camilla first met when travelling home from school aboard the 31B bus in Essex. He moved to the US in his 20s and we completely lost touch. Then three years ago, when planning to bring Moonstruck to Europe, Alan spotted Camilla's name on a review of a pilot book on Amazon, got in touch through Friends Reunited, and we finally managed to meet up for one evening in Barcelona at Easter in 2008. Later, Camilla mentioned on Facebook that Sam had always wanted to do an Atlantic crossing and Alan offered a berth. It all came together with a delivery trip from the Algarve to Gran Canaria in October, and then departure as part of the ARC, the Atlantic Rally for Cruisers, on Sunday 22 November. They finally reached the finishing line in St Lucia in the early hours of 10 December having spent 17 days, 14 hours, 49 minutes and 32 seconds on passage. You can read Sam's updates here on the blog - see links to the right. He found it, perhaps, harder work than he expected. Running with the tradewinds meant constant rolling from the big seas (see video above) and that's wearing both for the boat and the crew. They managed to destroy a spinnaker quite early on and all the other sails suffered badly – but still a great achievement for all concerned. Guy has astonished us by taking to sailing in a big way on a voyage on the 72ft Challenger, part of the Tall Ships fleet. Not only did he thoroughly enjoy the voyage (Ipswich to Portsmouth via various parts of northern France) he followed it up with a Day Skipper Theory course which he passed with flying colours. Clearly it's not sailing he hates, just sailing with his parents! Earlier in the year Guy spent several months in India, initially doing voluntary work in Delhi and Palampur, and then travelling around. It was an exceptionally hot year and he didn't go until spring, so he spent most of his time in the Himalayas, in Manali and on the second highest highway in the world, to Kashmir. He thoroughly enjoyed travelling but was pleased to get home to see Beth again – they have now been together almost four years. Camilla hasn't been anywhere quite so exotic but joined Aviva Europe in August for a six-month contract, which has meant travel to Dublin, Madrid and Warsaw so far – and learning to use Micrsoft SharePoint in Spanish and Polish. In odd spare moments Camilla now works as a volunteer navigation ranger on the Norfolk Broads (see ranger's keys, above). 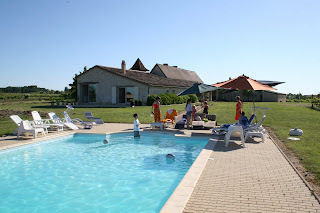 We also joined a massive Herrmann family gathering in a beautiful villa in the Dordogne at the end of May to celebrate Lucilla's 50th birthday (Camilla's sister). Our family sailing this year has been modest, but we did manage to find a couple of weather windows to sail Kalessin to the Netherlands in July, and home again three weeks later. Highlights included sailing through the busy oil and gas rigs off Ijmuiden at night, four memorable days moored in central Amsterdam (crammed into the Sixhaven, above), some great short-distance, shallow-water sailing on the Ijsselmeer, and the night transit of Amsterdam, heading south to the Delta. Ben (almost 17) is continuing to be brilliant. He now has 15 GCSEs including 4 A* and 9 A grades. 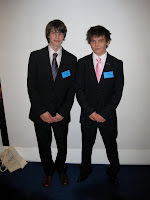 He applied for and won an Arkwright scholarship for youngsters interested in a career in engineering - pictured above at the awards with co-winner Josh (Ben on the left). He's now studying physics, maths and further maths, but makes life more interesting by also taking classical studies and philosophy & ethics. Suppertime discussions at home are getting very challenging. 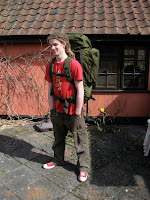 His interest in gaming is leading him to become scarily knowledgeable about IT – following a recent Windows crisis on his old laptop he was able to salvage key files by running Ubuntu (Linux) from an external hard drive. Gulp. 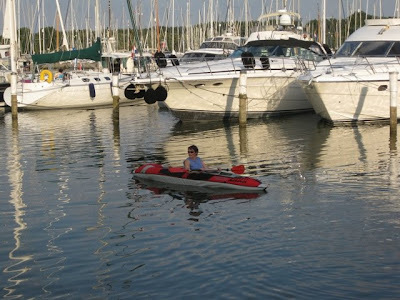 Ben built a kayak for his GCSE design technology project. 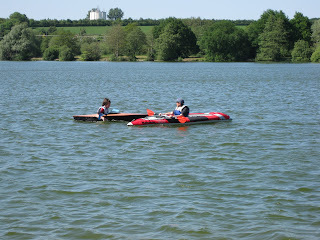 Here he is water-testing it along with Camilla in her birthday-present inflatable kayak. So, here we go with 2010, and we hope it is as good for you as 2009 has been for us. Moonstruck reached St Lucia shortly after midnight local time on Thursday 10 December, with an elapsed crossing time of 17d 14h 49m 32s. They actually crossed the finishing line at 03:49:32 GMT. I was in bed in the Warsaw Hilton and got a text from Sam at 0545 central European time. I love time zones. Apparently they were each then greeted by a massive rum punch of knock-out strength, and knew no more until late the next morning. You can read more about the final hours on Alan & Joan's log. Guy and I will go to Gatwick early on Monday morning to collect Sam from his flight. Meanwhile he is chilling out and appears to be finding lots of parties to join, including an improptu band with several guitars. Had an urgent invitation to a party on the foredeck in the early hours after the poled out jib sheet broke and the sail wrapped around the forestay. Why do these things happen in the middle of the night when you are asleep? Anyway, Alan and I were out there trying to recover the lazy sheet, straighten out and furl the sail, recover the lazy sheet and re-reeve it, while at the same time dodging an evil swinging pole (nothing to do with your Warsaw people) that threatened to take out the forestay (now that would have been fun). Took about 30 mins invlding re-set. Today's task will be to replace the other sheet. I'm getting good at balancing in 2m swells. More squalls to follow, but mostly rain with winds about 25 kts max. Back on course and hoping to finish at about 1700 local tomorrow, will text you when it happens. [This trip is] definitely a one off for me. Alan pleased to get World Service, but having heard horrible tales of brutality etc in Africa and more economic gloom stories, I wonder why we are so keen to get back to "civilisation". T. Pratchett v good, must read more. Don't know which came first but there are clear parallels with Hitch Hiker's Guide. Did I get it right about Gatwick arrivals. It says eta 9 something and two stars with a note that says arrives following day. Very confusing , especially as we are now into our third time change on the boat. What's wrong with UTC all the way, I say. Take care of yourself. I miss you hugely. Love to all. We have been having some problems with connections for email transmission so you may have had a bit of a gap. Anyway, progress is good after we hit a lull which lasted the best part of a day and a bit with very light winds. We have now run into the squall zone and encountered two of three little ones before hitting the big Momma last night (my watch of course). Winds up to 50 kts. We got the main right in and slimmed down the genoa (left the pole out). The squall looked huge on the radar and very black and threatening when seen alongside, with its own private donner und blitzen going on inside. The B... thing seemed to follow us, changing shape on the screen and developing "arms" that reached out to clobber us with heavy rain every time we tried to duck and run. We had to take a 60 degree course change to eventually shake it off. Not fun, but we were able to rack up some good speeds 9-10 knots at times. And of course in the middle of all this the autopilot dropped out and I had a hell of a wrestle with the wheel to get us back. Didn't do much for general crew morale which is a tad frayed in places. I'm ok. As the hired hand, I just slink off to the barn until it's all over. Oh how I love my Kalessin crew even old dreadlocks grumpy! Our boat is so easy and uncomplicated to sail, a shining example of the KISS principle. Played Trivial Pursuits with Tucanon yesterday, we lost, but not by much. I felt that the US contingent were less than enthusiastic because it had too many English questions. Alan has threatened to challenge them to Scrabble in which we have the board. Two yachts in sight this morning which is fine and bright with blue sky. Very hot. Distance to run now in the 700 range so (all things being equal) landfall by Dec 10/11. I am looking forward to a very long walk! Just sea (one bird) no fish (although we do have a line out but Joan has sworn to have nothing to do with whatever we catch), no tonnes of crude oil, no shortened ships in fact the Atlantic equivalent of the Aussie GBA. Very hot and sticky, winds very light, struggling to keep up to 5.5 knots. Hope for more breeze later. Many boats reporting damage, broken booms, spin poles, sails, rudders etc. A 50ft Bruce Roberts [steel yacht] has been abandoned after the rig became unstable and the engine packed up. All crew rescued by cargo ship and taken to Gib. One of the boats that diverted to the Cape Verdes with a medical probem has retired after finding an unspecified fault on the boat. We now have less than 1000 miles to go and St Lucia is on the same plotter page as our current position, which is a bit too south at the moment, but we can correct later if the wind plays ball. If propagation is good and the sunspots have healed maybe Uncle Herb can give us joy this evening. Am juggling MP3s on the night watch. Some of Nick's stuff is really good. Listened to a lot of Pink last night plus Gabrielle and Cilmi. I shall be so cool when I get back! Am still not used to broken sleeps. I expect that when I do get back, I'll still rise at 3am and dismantle the shower head before going back to bed at 6am. I think it's a silly place to put a shower control. The sea has calmed down a lot and is a fabulous colour, very tempting, but I'm not convinced about the MOB capability on board. This update from Sam arrived at 1.37am today, but I think may have been stuck in the ether for a while. As of noon today they had about 1000 miles to run and were goosewinging (wind dead aft). The first and fastest yachts are expected to cross the finishing line sometime tomorrow. Alan had a long conversation last night with a South African deck officer on a container ship bound for New York. He was a bit curious as to why he was suddenly ploughing through (not literally) 250 yachts. Madrid sounds fun [I'll probably have to go there in January - c]. Coincidentally I am reading about the siege during the Civil War. First flying fish on deck this morning, about as big as a tinned sardine. Pic taken. Showered and shaved and wearing last clean knickers. Did a Roamer trick by washing three pairs in the shower. They are hanging on the winch and getting salty. Still long on t-shirts. We have dived down a lot more South because the Grib files are showing very thin winds where we were. Herb was faint last night (They talk about propagation being poor and warn us about sun flare activity. New world to me). For the cocktail hour radio net tonight someone has organised a radio Trivial Pursuit contest. If Team Kalessin was here, we would be invincible! The big lead boats (Wallys etc) are about 850 miles off the finish and all pretty close. A record crossing is possible. We are still making up our lost time for the sail repair but did a 176 noon to noon from yesterday. We shall be moving south in the next few hours to dodge the forecast wind hole, so the pole will come down and the motion should be smoother. Sleeping is very difficult even with lee cloths and cooking is nigh impossible, but Joan did manage sausages and pancakes for breakfast yesterday. I passed on the mapleen syrup. The GPS is giving an eta of Dec 10 which is about what I expected, but we still have 1334 N M to go, but at least we are on the right side of the hill. Had a Vivaldi night last night (plus a bit of Status Quo). We have been using [radio] links from Nova Scotia, Switzerland, Virginia (US) and GC. Got good copy (that's how they talk here) with Herb last night, so are up to speed with weather. Poor Alan is a bit down, His father has been in for surgery but it turned out ok. His sister was less fortunate and bas been diagnosed with breast and lymph node cancer. He feels a bit helpless. Joan is holding up but I expect her to kiss the ground when we arrive. I have to say I shall be quite glad when I get back to terra firma. Running wing on wing with the Genoa poled out, big swells rolling like a good 'un. Can't put anything down. Had the curry on the cockpit table last night and with every roll it slid threateningly over the plate towards your lap. Our sewing on the sail seems to be holding up, pity about the rest which is unravelling readily. It seems that the Med UV has taken its toll of the sacrificial strip stitching, and the sailmaker who did the check for Alan did a crap job. Overall sail integrity ok though and I do not fancy taking it down again when we would either have to restitch the whole thing or cut it all off. Other boats report equipment damage and failure. I did not really appreciate what a pounding everything takes. More flying fish today. One boat had an egret drop in for a rest and another had a killer whale (they think) swim under the boat. The good news is that we are halfway. According to Lauren we are 22nd overall on uncorrected time (or is that corrected?) anyway, respectable performance. Another 180-plus over the last 24 hrs but we have been warned of a wind hole on Thursday. Herb is hard to contact at the moment but maybe we can get him tonight. Alan has updated the website with a data send via the Iridium. Starting to think about coming home but there is still at least another nine days if the wind and everything else holds. Really disappointing night, poor progress mainly due to a windshift in the night that brought the wind into the east, We have been having problems with the sails. Genoa sacrificial strip is fraying and we have already lost the leech line on the main ( I may have told you that already) Anyway, we were on main and staysail only and the windshift posted us way down south, making only 3-4 kts VMG to waypoint. Very rolly too, hardly any sleep. So today, we took down the genoa and bundled it into the cockpit to carry out repairs. Alan has a sailmakers palm but it is left handed. There is also a patent quick stitch awl but neither of us could get it to work, so I used it to make the hole and pushed the needle in by hand. There was quite a bit of damage so it took us a couple of hours. Then we had to rehoist the thing. I copped a big wave all over me. Very warm and salty. Had to stay head to wind and in the end we put the engine on (allowed in these circs) an d I steered. Job done -- but the fat lady had still to sing and Alan wanted the jib poled out. Fortunately we had a dress rehearsal in Gran Canaria so it went up fairly painlessly. Much better motion, some rolling, but importantly we are dead on course and making good speed. 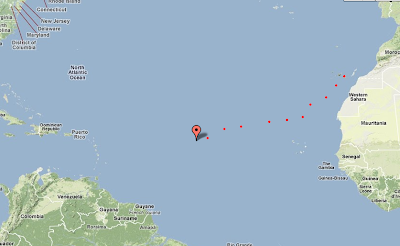 We did 185 miles on the log noon to noon today, but I expect we lost in distance to St Lucia. One thing has struck me, Kalessin is a much more efficient vessel and much easier to sail well. Winches, cleats, deck gear, all sensibly placed, this boat has very primitive sheet leads that cannot be adjusted from the cockpit. The boom vang adjustment required you to go out to the foredeck (you could I suppose dive through the front of the greenhouse) and the power winches are a pain with complex sheet leads so that the power winch can drive them. What's wrong with a bit of manual? Joan and Lauren both played blinders in today's turmoil and I suspect we shall all sleep very well tonight roll or no roll. When It's like this I sleep in one of the main saloon bunks with lee cloths. Felt the need for an Indian after all this effort and so Joan is doing a chicken tikka balti. Let's hope things are stable tonight. I am about to have my shower and put some clean clothes on. Balti on your t-shirt spoils the effect! Saw our first flying fish today and last night a three masted schooner. Sunny and hot. Took a pic of the schooner but it was probably too far away. Flying fish ditto. Wind flukey last night, lost speed. Couldn't get a good connection with Herb [weather guru] either. Better this morning , back up to 8 knots. Problem today, topping lift rope has worn through leech line pocket on the main, so we have a fluttering leech. Also some chafe on top of one of the batten pockets. Object lesson in chafe protection (or not). Have set staysail which seems to be helping. I miss our boat and our crew. Never been to thanksgiving before, let alone mid-Atlantic! Delicious aromas coming from the galley. Due to eat in about 45 mins. Good run last night, around 180 miles noon to noon. Gybed the boat at 0300 and now making better Westing, more direct route to St Lucia. We are getting weather info and routing from a guy called Herb Hildenberger via SSB. He lives in Canada. He suggested we get down to Lat 20 where he expects better winds. The northern placed guys look set to find winds dropping to 5kts and as we have no light airs sails (any more!) we need to follow the wind. We are thinking of ways to jury rig the wrecked spinnaker. 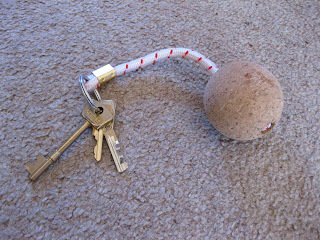 We could only use it in very light winds, but it would be better than nowt. Lauren thinks our spinnaker would look better in a Paisley material. Personally a nice pastel tartan would suit me! No more alarums and excursions, quiet night, no ships seen or yachts. Skies overcast. Getting hotter, butter is melting and we have turned right! Some problems with rest of fleet. One yacht abandoned with rudder failure. Crew rescued and yacht now salvaged by Tenerife based rug. Two other yachts returned to Las Palmas with rig and other problems and a nice crowd of Canadians we met are diverting to the Cape Verdes with an injured crewman. We think he may have fallen and broken something. Drama strikes! Good night run with spinnaker (cruising chute really) then at about 0800 monster broach. broken glass all over floor, me stuck like a stranded beetle in my bunk. Autopilot overcome by combination of big wave and sudden gust. Boat recovered but spinnaker dipping in water. Went on deck to raise halyards a bit. All settled and I was below changing into shorts after breakfast when big bang, spinnaker tore straight across the head, sail in water. Took Alan and me around 30 min to recover the sail, it will see no further service this trip! Now under reefed jib and main, less rolly but speed down. I guess we should really have downed the spin earlier. Wind 20-24 true so bearable. Swells 2-3 metres. No worries all well. Only casualties some wine glasses. I am staying safe. Sam just called to say Moonstruck is about to leave the pontoon. He says it's mayhem, bow-thruster city, even through there is a staggered start - they are actually due to cross the line at 1300. He says he is nervous, in fact everyone is nervous. Even I am nervous on their behalf. I'll be following Moonstruck on their crossing log and their position on the ARC site. At noon tomorrow Moonstruck will head across the start line off Gran Canaria and out into the Atlantic, on her way to St Lucia, with 219 other yachts in the 2009 ARC, the Atlantic Rally for Cruisers. Sam will be on board with Alan and Joan Teed and their daughter Lauren, and they expect the crossing to take around 20 days. Sam flew out to Las Palmas last Friday, and I went too, for a few days of warmth, sea, and soaking up the atmosphere of one of the world's biggest cruising events. The enormous pontoons were filling up fast, and so many of the yachts were over 45ft that anything the size of Kalessin looked like a dinghy by comparison (although in fact the minimum size for entry is a modest 27ft). I've just looked at the entry list and the smallest entry is a Sadler 29, the same as Magewind, our previous yacht. Good god, I am impressed. However, out of the 220 yachts only half a dozen are 10m (33ft) or less. There are loads of parties, dinners, briefings and other jolly events including the opening flag-raising (tasteful reflection, above) and an entertaining dinghy race. Overall however the atmosphere is a bit on the tense side. People are worrying about rigging, electronics, navigation, safety, fuel, weather and victualling, and indeed anything else they can think of. By the time I left on Tuesday the gate to our pontoon was permanently open so El Corte Inglés could deliver endless supplies of shrink-wrapped foods. Boats with dodgy watermakers, or none, were shipping dozens of huge water containers. Someone was always up a mast somewhere, and anyone with diving gear and a scrubbing brush could do quite well for themselves cleaning hulls. 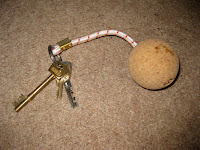 Many yachts were still waiting for parts - Sam managed to bring a key exhaust elbow for Moonstruck's Fischer-Panda generator out from England, the one ordered from the Spanish agent is probably still on its way, very slowly after Alan declined to pay an extra €70 for express shipping. The Israeli boat across the pontoon was running its generator for an hour or so every morning and only managed to get water flowing through it consistently on Tuesday. (An un-cooled generator is an extremely noisy animal). Alan and Joan have been in Las Palmas for six weeks and have been able to devote all that time to planning and worrying. Supplies of food are documented in a spreadsheet, with meals planned day by day and snacks allowed for. Joan was very concerned that there was enough Pepsi for one can per head per day, but what if Lauren suddenly decided mid-Atlantic she wanted Fanta? An Italian yacht with six crew was shipping 200kg of pasta, which works out to around 1.5kg per head per day, unless they were expecting a really slow passage. A Canadian racing crew were planning to live almost exclusively on freeze dried food - all of them were males, so no surprise there. Sam and I took a bit of time to wonder around Las Palmas. I must say that if we ever do the ARC it is not a place where I would want to spend six weeks, although the old centre is nice (but small). Based on my vast experience of Las Canarias (about 11 days altogether) I would spend four weeks in San Sebastian de La Gomera and head over to Gran Canaria as late as practicable. La Gomera is not so handy for the airport (the nearest is on Tenerife), or for the huge array of suppliers in Las Palmas, but to my mind a much nicer atmosphere. Meanwhile Guy is down at Suffolk Yacht Harbour completing his RYA Day Skipper theory course. He went down there after supper yesterday evening intending to spend the night on the boat, and at around twenty to eleven I got a cross phone call asking where the hell Kalessin was (she came out of the water around 10 days ago). After an hour's searching in the dark and cold he found her down by the lightship, hundreds of yards from where she was last week. Apparently the yard moved here because she was next to a huge tent which seemed likely to blow on to her. What a pity they didn't tell us. Sam, 1500 miles away and in touch by text, is Very Cross. But at least Guy found her in the end and had a good night's sleep. Well, here Ben and I are, at home on this rather pleasant September day and thinking about going kayaking on Rockland Broad. Meanwhile Guy is on a 72ft Challenger yacht, last seen in Dieppe (pictured here just before he set off from Ipswich last Tuesday). 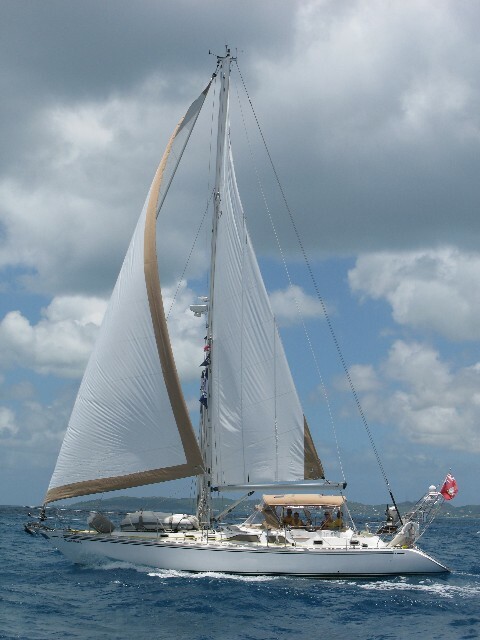 Sam is on the beautiful Hylas 49 Moonstruck, belonging to Alan and Joan Teed, heading for Madeira and then the Canaries, then home for a few weeks and then from Gran Canaria to St Lucia with the ARC. Why does Rockland Broad seem so staid by comparison? So... 111.3 miles in 21 hours, about eight or nine of them sailing properly. Flat seas, light winds and a blooming Dutch boat in our berth when we got home. If we'd wondered where all the Dutch boats had gone as we squeezed into their marinas, we found the answer - they are all on the Orwell. 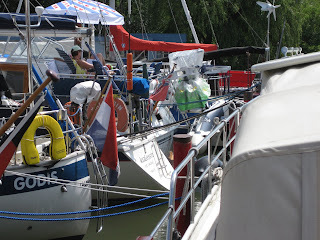 It was really strange to see boats from Enkhuizen, Medemblik, Volendam and Lelystad filling up Suffolk Yacht Harbour - when we were in those places we hardly saw a British boat. The really infuriating thing is that Helen's funeral was eventually fixed for next Monday and has now been postponed again, so we could have stayed an extra few days. Still, the weather was pretty good for a crossing and there's a possibility of fog over the next few days, which is almost worse than wind. We had warm air, almost a full moon, and Ben stood a watch on his own for the first time. The best bit for me was the last leg from North Shipwash down the Sledway, when Sam and Ben were both asleep exhausted, the wind gave a us a beam reach (I'd feared we might be motoring into the wind), the tide turned at the right moment and we galloped along at 7.5 knots for a couple of hours. The sun even came out. Anyway, too tired to write more... must get some sleep (1.5 hours last night). England is full of annoying little flies, which arrived on the boat halfway across the North Sea, and combine harvester noises. Last week Sam's cousin Helen complained of a headache and went to hospital. She was diagnosed with a brain tumour and died over the weekend. So we're returning home with all speed so that, hopefully, Sam can get to the funeral which will be in Guernsey where Helen lived. Slight change of plan therefore, as when we heard we had just reached Dordrecht which ironically was our furthest point from the sea. After the Amsterdam night convoy we were a bit weary and decided to spend Saturday at a very pleasant marina on the Brassemermeer - we arrived about 10.30am and felt like wimps beside the Dutch people who were planning to carry on south all day. However we made up for it on Sunday when we made part of a new convoy of yachts heading south on the standing mast route, missed the rail bridge at Gouda by about three minutes and someone in the group persuaded them to make an extra opening, just for us. So we pressed on through numerous bridges and reached Dordrecht around 6pm. Not a good arrival, although it's a delightful little harbour we last visited five years ago in Magewind. We managed to hit our neighbour's boat with our anchor as we arrived, chipping their expensive gelcoat. The Lavac failed entirely, leaving us with a blocked loo and no onboard facilities. And then Sam got the news about Helen. Today we did a non-stop run through the Delta to Colijnsplaat, whence we hope to depart tomorrow for the UK - so far, the forecast looks pretty good. Non-stop... except for the immensely slow locks on either side of the Volkerak lake. Our neighbour in Dordrecht suggested we should leave from Stellendam instead, as it would save about four hours on the passage, and I'm sure he was right, but I have no information about North Sea passages from Stellendam which takes you straight into the inshore traffic zone and then to the dreaded Noord Hinder traffic scheme. So we went with the devil we know and headed for Colijnsplaat. OK, this is a bit weird. We're moored up on a canal in central Amsterdam, rafted three deep, and waiting for the night convoy to start sometime after 1am. There are about 50 possible wireless connection of which only one is insecure, and here I am. The first bridge is the key one, a massive rail bridge with six counterweights. I can't believe it opens. On the Broads the rail bridges sometimes get stuck and don't open for days. That would never happen in the Netherlands. Thank goodness it's a beautiful night, warm, very little wind and pretty pleasant. The only thing to worry about now is what happens at the other end - where do we go at 4am on the Nieuwe Meer? There are loads of marinas, most just about deep enogh for us, but how do we find them in the dark? Or given that the Nieuwe Meer is just before Schipol, will the glow in the sky be enough to see by? Our plan is to head down to the Delta on the standing mast route. This includes something which Sam has always wanted to do, going through Amsterdam in the midnight convoy because there are two rail bridges which only open once a night. 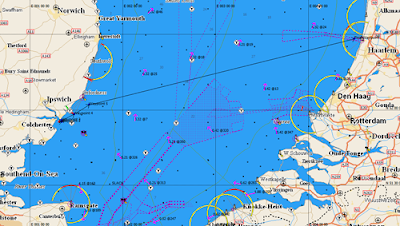 The advantage of heading south is that the route back to the Orwell from Vlissingen, say, could mean a reasonable beam reach into a south-westerly, instead of being on the nose from Den Helder or painfully close-hauled from Ijmuiden. And we've had nothing but south-westerlies for weeks. From Hindeloopen we headed to Stavoren, only five miles in a straight line but 10 beating into the south-westerly. Then on Monday back to the sheltered side of the Ijsselmeer, motoring in a calm to Enkhuizen, and on Tuesday close-hauled (with Ben complaining loudly about all the stuff falling on his head when we heeled to 30 degrees) down to Monnickendam, only 15km in a straight line from Amsterdam but rather further by water as it's tucked into a very sheltered spot behind the Marken island dam. Here we faced a dilemma. A serious depression is crossing to the north of us bringing several hours of strong winds. It was due to hit around 3am onwards on Thursday, which meant that if we followed the original plan, just as we reached the end of the night transit through Amsterdam and emerged on to the pitch black Nieuwe Meer we would be hit by gusts up to 30 knots and pouring rain. The prospect was pretty awful but the risk was that if we stayed in Monnickendam, with the strong winds continuing into Thursday, we would be delayed two days because the south-westerlies would be too strong in the very shallow Markermeer. In the end we decided to stay. The wind arrived at 5am this morning, so we might have been OK, and the forecast is for F7 until this evening so we will lose another night here. Who knows, perhaps we should have done it differently. Monnickendam is very sweet. On our first morning the havenmeester brought us three fruity buns with butter in a little basket, with the compliments of the marina. It's very much a holiday place, with slides, trampolines, boules, and free rowing boats which you can borrow to take you into town. For the first time on this trip we have used the folding bicycle and launched the inflatable kayak which has been great fun, making the most of the sticky, calm day we had yesterday. Unlike the huge marinas in Stavoren and Hindeloopen there are some modest yachts here and when the wind gusts it howls less than usual because there are fewer yachts with in-mast reefing (the slot in the mast reverberates in strong winds). The downside is that in this very sheltered freshwater harbour there are zillions of mosquitoes, and they are all biting me. We finally left Medemblik this morning with a forecast of W4-5, decreasing to SW3-4 this evening. The forecast was just about accurate and as expected the Ijsselmeer got choppier the further west we headed (with more room for the waves to build up). Once again we were sailing with just the foresail, with quite a few rolls in it, and even that was really more than enough. The water was a particularly repellent shade of slime green and the waves were probably no more than ½ metre, but that's pretty uncomfortable when there's only 2m of water beneath your keel. 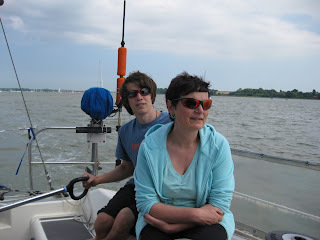 Last time we were out on the Ijsselmeer in similar conditions (probably, in retrospect, lighter winds but a similar bumpy sea) we were in a chartered Van de Stadt 27 and Guy was about 16 months old. We sailed from Lemmer to Stavoren and I ended up in a quivering heap on the floor of the saloon clutching Guy and convinced we were going to die. I think I've made a bit of progress since then. When we came to Friesland two years later in our 16ft Winkle Brig and both boys, we didn't even venture out on to the Ijsselmeer but stuck to the Friesian lakes, which seems very wise in retrospect. This time everything was fine until we approached land – the marina here is not very sheltered from westerlies and Kalessin's modest engine and prop don't do her any favours when making tight turns in a force 5. Mooring up at the reception pontoon, then turning again and heading for our allocated berth, involved lots of screeching (by me) and revving (by the engine). I think it was perfectly reasonable to complain that when Sam says “head up there”, I can't tell where “there” is, because I am squatted down by the throttle control. He says I should know. This is a man who, when things get tough, shouts “pull that rope”. Honestly, sailors have spent hundreds of years evolving names for ropes, why not use them? Anyway Hindeloopen is very sweet, our first visit to Friesland for many years (Sam has just found the Friesian courtesy flag we bought when we were here in the Winkle Brig in 1993), and the wind is at last (6pm) easing off a bit. Sam has found a replacement pair of sunglasses and a useful spanner for dismantling the diverter valve (loo repair attempt no. 3) in the chandlery. There are even more Germans here than there were in Medemblik and we've only seen one British yacht since Amsterdam. I thought lots of Brits came up here, where are they all? We left Amsterdam on Monday after several days of waiting for a forecast which didn't have a force 7 in it. Winds are generally a force or two less in the inland lakes than out in the North Sea, but both the Markermeer (the southern bit of the Ijsselmeer) and the Ijsselmeer itself are extremely shallow (3-5 metres) and a strong wind can whip up an unpleasant chop. In the end we sailed all the way to Hoorn with just the foresail up, and three or four rolls in it. It was a great sail except that, as in the French canals, we had to get used to only having 1m of water under the keel and not panicking. Almost all the towns around the Ijsselmeer have hundreds of years of interesting history and Hoorn is no exception. They also have a choice of mooring places – the old town quays, which are usually right in the middle of town and require rafting up, not much privacy, but very picturesque; sometimes an older marina based in a dock marginally further out of town; and a huge new marina built on to the outer side of the sea wall. In Hoorn we went for the outer marina, which was vast but still surrounded by trees. The awful thing is that having subsequently spent two days in Enkhuizen I find it really difficult to remember Hoorn at all. Another nice thing is that all the towns are only 10-15 miles apart, so you can set off at a very civilised time, say 11am, drift gently or sail enthusiastically (depending on the wind) for two or three hours, and arrive at your destination in plenty of time for a late lunch. Unless the wind drops completely you can afford to sail all the way, and of course there are no tides to worry about. We drifted up to the lock (sorry, 'Naviduct', as it goes over the motorway) at Enkhuizen which lets you out of the Markermeer and into the Ijsselmeer, and decided to go for the older of the two marinas, which is almost out of town as Enkhuizen is so small. Unlike Hoorn which has acquired loads of suburbs, Enkhuizen stops at the edge of the old town. Enkhuizen also features the Zuider Zee open air museum, which we think we last visited with Guy about 18 years ago. 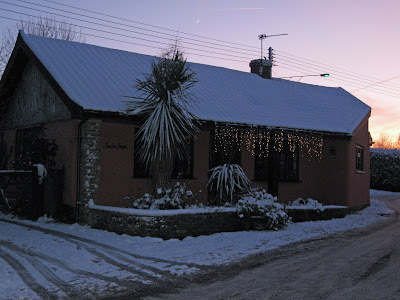 This is a village of original and reconstructed houses from the past 200 years, which allows you to nose about extensively and in a few cases actually see the crafts being re-enacted. Ben wasn't sure he approved, as the costumes and style really aren't up to Kentwell Hall standards, but even he was eventually won over by a combination of the steam laundry, the tiny canals and numerous privies in which we photographed him. He wasn't so sure about the smoked eel, smoked on site in the traditional way, but Sam and I thoroughly enjoyed it although it took about six hours to get the grease off our teeth. From Enkhuizen we sailed to Medemblik which is something like the Netherlands' answer to Cowes – it's focused almost entirely on sailing. We sailed through a grey, rather wet morning and are in the inner marina, which is very pleasant and surrounded by gabled Dutch houses, albeit not very old ones. It's also pretty cheap - €14 a night. The town is modern and not enthralling, although it does feature possibly the most expensive chandlery I've ever seen. 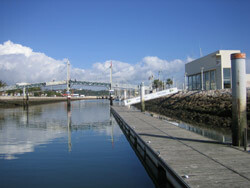 Behind the marina, however, is a delightful park and walks through to the new, outer marina and the picturesque castle. By the time we got there the clouds had gone and the Ijsselmeer had turned the most astonishing shade of blue. Today is apparently the start of the Bic Open dinghy championship – these are tiny craft like modernised Optimists (special offer championship price, €1,999) and there were about 20 brand new ones on the quay. We sat for a while and watched various youngsters launch and try them, before returning to the boat for dinner. Restaurant prices in the Netherlands are similar to the UK and with the current euro exchange rate we are eating in most of the time – other than a fishy meal at the clubhouse in Ijmuiden and an excellent meal at Top Thai in Amsterdam. Today the Thames sea area forecast is SW 5-6, and although that's probably quite manageable in the Ijsselmeer we thought we'd take the opportunity to stay here so Sam can have a good look at the sea toilet, which seems to be pumping unpleasant substances out but not bringing any fresh water in. From January this year you're not supposed to pump your loo into any Dutch water anyway, instead using a holding tank which can be emptied at a pump-out station (sadly our holding tank doesn't have this facility). There are pump-out stations here but so far we have seen no-one using them – hmmmm. Anyway the sky has gone black, the wind is howling and thunder is rumbling, so we're quite glad to be here. Also, despite their multivariate history, one charming Ijsselmeer town is not that different from the next one so there's a strong incentive not to bother to move on. Every yacht has bilge gods who live on small items which get dropped into the bilges. 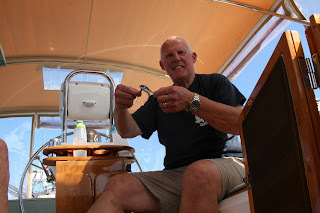 They seem to be very hungry today, as they have eaten not only Sam's beloved Gill sunglasses but also the key tool-roll which he needs to mend the loo.... of course it's just possible that the tool-roll is still at home and the sunglasses were left somewhere in Enkhuizen. I can't believe these depressions keep coming over. Isn't there supposed to be a gap between them? This feels like the umpteenth day with force five to seven gusting eight, and there's no end in sight with at least another two lows lined up to hit us in the next few days. We've done Van Gogh, Vermeer, Rembrandt, loads of pretty canals, a nice Thai meal, a visit to a camping shop/chandlery (for new cheap waterproofs for Ben), a Dirk supermarket, seen a few ladies of the night (in the afternoon), inhaled a lot of interesting smoke and crossed the Ij a good many times on the ferry. Perhaps after four nights it really is time to move on? Just a quick one as this connection is a bit erratic, although free. We arrived with perfect timing at the Sixhaven in Amsterdam yesterday and squeezed into a "box" mooring. We thought it was tight but about another 15 yachts rafted up in the access channel, with loads more all the way down the marina. This is not a place where you can leave suddenly in the middle of the night! Five minutes walk and a free ferry away is Amsterdam Centraal Station which is about as central as you can get. Yesterday we just wandered around the city. Today we took a tram to the Van Gogh Museum, which was wonderful, and walked back by a slightly circuitous route, buying essentials such as Geneva gin and Dutch bread on the way. Well, we made it to Ijmuiden with almost no problems apart from a nasty, choppy sea with short, steep waves for the first half of the journey. We left Suffolk Yacht Harbour at 0445 on Monday and reached Ijmuiden almost exactly 24 hours later, having sailed (without engine) for most of the daylight hours and covered 130 miles. We got a personal forecast from weatherweb.net before we left, as we usually do for long passages, and it was pretty accurate. Although it was very windy on Sunday night it died away as promised and the dawn in the Orwell was peaceful and beautiful with the winds gradually increasing to a peak of about 12-16 knots from the south-west. John at weathwerweb mentioned that we should aim to get in before Wednesday as that looked less pleasant, and indeed he was right – it's pretty windy here today, maybe F5-6 on the beach; great for kite surfers, of which there are dozens, but hard work for sailing. It's interesting that we have seen quite a few yachts going out. In the Med in these conditions you'd hardly see one. On the English side the sea was fairly empty but just before halfway we crossed the first of the deep water routes and after that there was always shipping in sight. Avoiding it stopped us from getting bored. It took us a while to get our sea-legs but around teatime when things calmed down we were able to avoid a couple of bowls of the now-traditional “crossing stew”, made with pork, new potatoes, and all the vegetables at home that I needed to finish off before we left. For most of the way the sun shone and the sky was blue, which was a real bonus. During the night we passed dozens of oil and gas platforms. Most are lit up like more than Christmas trees, some have additional flashing lights and horns every few seconds, they are bigger than most container vessels, yet even so we heard frequent warnings on the VHF to ships (and one yacht) apparently heading straight for a rig without being able to see it. Heading along between them felt like driving down Eastern Avenue at Christmas, with all those brightly decorated houses on each side, yet you don't have any contact with them or they with you. Ijmuiden is not highly rated on the tourist stakes but it has a comfortable marina and a great sandy beach, with lots of bars and cafes and a small supermarket. We were hoping for a decent chandlery as we managed to forget all our spare oilies which Ben usually wears, but unfortunately the nearest chandlery is 15 min bike ride away (we only have one bike) or two stops on the bus and then a 1km walk. Both seem like a lot of hassle bearing in mind that this is the Netherlands, which is full of chandleries. Let's hope it doesn't rain too much before we pass the next one. Tomorrow we plan to head down the Nordzee canal, 13.5 miles to Amsterdam. While I've been typing this the wind has increased from the high end of F4 (16 knots) to around F6 (22 knots plus). And we're in a sheltered marina. Our North Sea weather window is now definitely closed. Between the Scandinavian depression heading off to the east, and the depression forming somewhere off Ireland, Saturday might be quite a nice day with perfectly sensible winds up until late morning on Sunday. So if we left on the 2am tide tonight (i.e. Saturday morning) everything might be fine. On Sunday it's due to be F6 again, and of course it might arrive early. Also, the waves - following yesterday's wind, there's currently about 2m waves in the southern N Sea, which has the potential to be extremely uncomfortable. Anyway we are chickening out again and waiting to see what Monday brings. But we will go for a day sail tomorrow. Then perhaps Sam and Ben might really believe we are going, and start packing - so far I'm the only one who has put a few things in a heap, and even my heap isn't that convincing. Possibly we could have gone today. On this side of the North Sea there is a window of opportunity after Monday's depression passes to the east and a new depression sweeps down from Scandinavia on Thursday. Unfortunately on the other side the window looks much smaller. If the depression arrives earlier than expected we could be heading down on to the coast of the Netherlands on a lee shore at F6-7. I thought I was a bit of a wimp avoiding the forecast for today of SW4-5 occasionally 6 - I'm sure we'd have been fine. If that's what had happened. Wind Westerly or southwesterly 5 to 7, increasing gale 8 for a time. So I'm glad to be at home. Before we head off to the Netherlands we thought it would be a good idea to try a shorter cruise – just to check that everything on the boat works, that we remember how to sail, etc. We expected to do this on Saturday or Sunday, but when we visited the boat on Thursday it transpired that Lindsey had already finished the work on the Morse controls. I searched desperately for another excuse not to go but the only possibility was that the wind was due to go to the SW, a really bad direction for heading from the Orwell to the Blackwater which is where we planned to go. On the other hand the strength was only 3-4, so really pretty manageable. So on Friday afternoon we had a somewhat bumpy passage for the 29 or so miles to Bradwell. The best sailing was coming down the Orwell; from Landguard onwards we tried different varieties of motor-sailing until eventually the sea calmed down as we approached the Blackwater estuary and we made better progress. We celebrated our arrival with a couple of drinks and a pizza, I had a short walk to stretch my legs, came back and started getting ready for bed. (It was about 9.30pm). I wondered why the pink towel was on the floor of the forecabin, and why it was soaked with salt water. Turns out that some of the waves breaking over the bow had run down into the cupboard in our bedroom. I vaguely remember Ben mopping out the cupboard... and then oblivion until midnight, when I suddenly awoke and realised that the fridge compressor had been on without a break since we left Suffolk Yacht Harbour. I had a cross, sleepy conversation with Sam, turned off the fridge, and then went out like a light again until 7.30am. The fridge worked fine the next morning. So did the sailing back to Suffolk, although initially there was no wind at all and then what there was appeared to be coming from the north-east, which would be spectacularly unfair. Fortunately we actually got about a F3 from the south-east with a splendid sail from the Bench Head buoy all the way to Suffolk Yacht Harbour. It's much easier to see the Gunfleet sand than it used to be, because they are building a very large offshore windfarm on it. Unfortunately the forecast now looks as though there will be SW5 or 6 on Monday and Tuesday, so Wednesday looks like the earliest departure. We'll see how it goes. I finished my contract with Aviva UK on Friday 26 June - and I don't start the next one with Aviva Europe until 10 August. So that gives us six weeks to go sailing. Ben has finished his GCSEs and has availability. Guy doesn't do sailing. So have we gone yet? Err... no. We've taken Kalessin out a couple of times so far this season and both times the throttle felt very sticky and unresponsive. I do most of the throttling :-) and wondered if I was making unfair comparisons with the Broads launches, which have about three times the power. Anyway, Sam got Lindsey, our engineer, to check over the connections, and the bad news is that we really need a new Morse control. The current one was fitted when the boat was new, i.e. 21 years ago, is very worn, and may fail any time in the next year or two. I can think of lots of situations when the throttle connection might fail, and very few of them are the sort of situation where you could say "oh well, never mind". So we are waiting for Lindsey to complete the fitting, which won't be until the end of this week. While Sam was down at the boat last week I asked if he could check that the radar was OK. We didn't use it at all last season, and most of the time it was disconnected because the scanner was attached to the mast in Calais, while we were on the canals. "Oh", he said, "I've checked it already, it was fine." I suggested that it might be a good idea to run it for an hour or two just to be sure. Then on Saturday, I took a call from Phil, who does our electrical and electronic stuff. "Sam says he's concerned that the radar isn't working," he said. Ah... possibly he forgot to tell me? Anyway we were very concerned for a couple of days because we thought the processor might have failed (£1,000 for a new standalone radar, or anything up to £4,000 for a new radar/plotter combination, plus we might have to chuck away £1,000-worth of existing electronic charts). Thank goodness, it seems it was a faulty connection. The radar lives to fight another day, which is just as well considering the current hot weather is also generating a lot of fog in the North Sea. Actually we're quite glad not to be going yet, because the current hot weather is also distinguished by fairly steady easterly winds, force 3-4. Absolutely perfect for sailing from the Netherlands to East Anglia, but rather a nuisance for going in the opposite direction. It also gives me a chance to clean the house, weed the garden, plough through vast piles of personal admin, catch up with my blogs, go for walks and even (tomorrow) go to work for a day. It also gives me more time to plan the route - wind and weather permitting, it looks like Harwich to Ijmuiden, which is a long but straightforward passage with the delightful characteristic of being to the north of all the traffic separation schemes and precautionary areas (for non yachties, this means you can go in a straight line once you're clear of the Shipwash bank). I'm hoping that we'll have time for a bit of a shakedown cruise to the Blackwater, to help us remember what it's like being at sea - yes, the Wallet isn't quite open ocean, but it's a lot more like real sea than the Orwell. I'm a bit shocked to see that it's five months since I last posted to the blog. Admittedly, we haven't yet been sailing this year (although Kalessin has been in the water since mid-May), but we have had a few other waterborne activities. 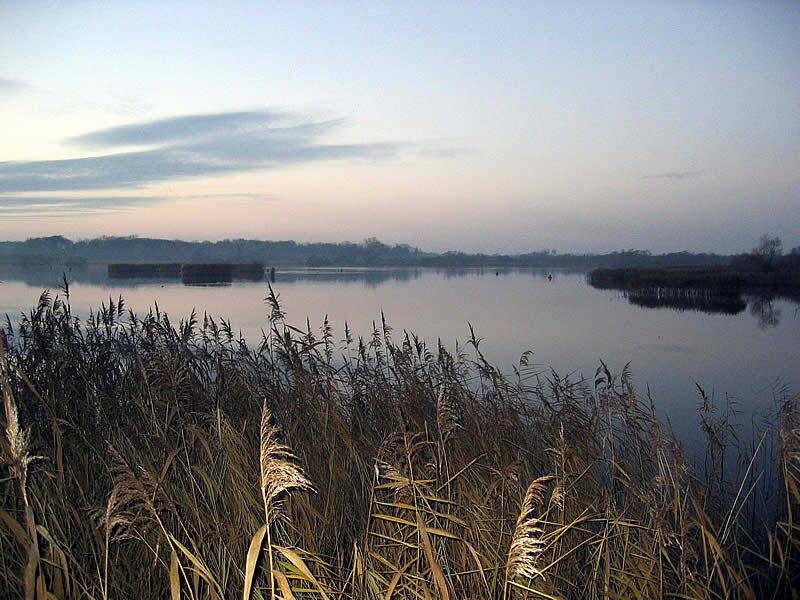 In April I passed my assessment as an Auxiliary Navigational Ranger on the Broads and got my keys.... Very long pause there while I worked out how to export images from iPhoto. I'm still getting used to using a Mac. Anyway I'm now out on the rivers a couple of times a month, which is great. 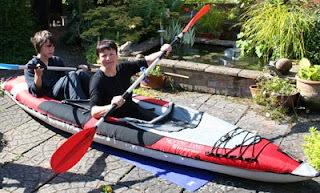 ...an inflatable kayak. Ben & I have been out today for our first proper expotition, around Geldeston on the Waveney. Ben was so tired afterwards he came home & slept for three hours. Or perhaps it's the GCSEs? After weeks of agonising over colours, patterns, textures, fabrics, prices and more we have finally commissioned Jeckells* to replace all the upholstery on the boat. I feel kind of guilty because it's such a girly thing, but as the old seat covers were splitting in several places we really didn't have much choice. In addition they will remake the cushions in the cabins so that the base boards and cushions are separate - no idea why Westerly made them in one piece originally, but the result is that the cushions are heavy, unwieldy and in the case of the aft cabin are actually too big to get out through the door. If we do go back to the tropics (or just anywhere warmer than the UK) we can also replace the boards with bed slats from Ikea to allow better air circulation. * Jeckells and Sons, the upholstery people in Wroxham, established in 1832, are not under any circumstances to be confused with Jeckells the Sailmakers in Wroxham, established in 1832.